"Mainly it is important to remember the kindness of the Buddha and abide in that remembrance." Kyabje Choden Rinpoche, Losang Gyalten Jigdrel Wangchuk (lit. “Teaching of the victorious Losang (blo-bzang rgyal-bstan), fearless (jig-bral) sovereign (dbang-phyug)”, was born on May 31, (the Tibetan New Year) 1931 in the Rong-bo district of Kham in eastern Tibet and was a reincarnate master of the Chöden lineage, the historical abbots of Rabten Monastery. Rinpoche’s great-grandfather, grandfather and father were all great practitioners. His great-grandfather and grandfather belonged to the Kagyü school and his father was a Gelug practitioner, all of them were lam-rim holders. The late Choden Rinpoche has been known amongst his peers and students as “master of the five sciences” (sciences of medicine, craftsmanship, logic, grammar and the inner science of Buddhism), as extraordinary scholar of Tibetan Buddhism, yogic practitioner, and for being extremely gentle, kind and compassionate. Choden Rinpoche received his name from Phabongkha Rinpoche, whom he met at age 6, and took many teachings from him at Rabten monastery, as well as ordaining under him. H.E. Choden Rinpoche was born into a “family of (minor) nobility”, (euphemistically rendered post-1959 as “family of an official”) that consisted of nine sons and five daughters. He was recognized at age three as the reincarnation of the previous Choden Rinpoche, who in turn had been “one of the candidates for [recognition as] the twelfth Dalai Lama”. According to Geshe Tseten Gelek of Sera Jé—long time assistant to Kyabje Chöden Rinpoche—Rinpoche’s third eldest brother, Geshe Thubten Yampil rose to local prominence as a compiler of over fifty volumes of Buddhist text and as a teacher of the Kālacakra tradition. The second eldest brother was reportedly “able to recite the Buddhist scriptures without even seeing them”. Kyabje Choden Rinpoche himself displayed similar feats of accelerated memorization, retaining prayers and scriptures with minimal effort and in only a fraction of the time normally required. Shortly after his recognition as the reincarnation of the abbot of Rongpo monastery, who had been the previous Choden Rinpoche, his uncle began tutoring the young lama. At the age of 15, His Eminence left his local seat in order to enrol in Sera monastery, where despite relative hardships and poverty, Rinpoche did exceedingly well in his studies and meditative practices, and excelled at debating. Rinpoche recounts (Mandala Magazine, July/August 2000): “I followed the regular curriculum of Sera Monastery, studying each of the main five texts. For the first part of the studies you do the same studies as the rest of the monks, but when the geshe studies begin they give a jump-start to the tulkus. I was in the same class as Geshe Sopa Rinpoche, Geshe Ugyen Tseten and Geshe Legden for two or three years. At Sera monastery the main program is philosophy, the geshe program. But there are different hermitages of different lamas, and they would give teachings. I attended many of them. The main teachers at that time were Bari Rinpoche, Trijang Rinpoche and Ling Rinpoche. I enjoyed these teachings very much, although sometimes during the main curriculum of studies at Sera, when you get to a very important part of the text being studied, you didn’t get permission to go to these other teachings. I enjoyed debating and wasn’t too bad at it. I studied with some of the best debaters at the monastery, like Geshe Loga and Geshe Losang Wangchuk. Having been guided by them I was able to debate very well. What you would consider a good debater is a person who, when debating on a given subject, can point out to the other person their mistaken view; you can debate it by being able to explain why theirs is not the correct view, using logic, reasoning, and by quoting scriptural authority. By the way you debate you show them their wrong view and they can completely give it up. That’s the sign of a good debater: being able to enlighten the opponent to their fault and create the basis of the correct understanding through logic and scriptural understanding. By 1959, Rinpoche’s had become so proficient at debating, that His Eminence was chosen as one of two debating-partners hailing from Sera monastery for the occasion of His Holiness the fourteenth Dalai Lama’s publicly held Geshe-examinations. Rinpoche debated with His Holiness on the topic of the “two truths”. Despite an interlude of many years, when reunited in exile, both His Holiness the Dalai Lama and Kyabje Chöden Rinpoche remembered the episode with fondness and in detail—according to His Eminence, His Holiness displayed a nimble mind and remarkable acuity during the examinations. In 1959, year of the Tibetan uprising, the political situation worsened, and Rinpoche was imprisoned for a month: “They started to separate all the lamas, all the geshes, all those who had management positions of any kind. They categorized people, and the general monks were kept as one group. They used to say, “Ones without any titles are our friends, while ones who have titles are our enemies” . Since Rinpoche came from a family of local nobility and moreover hailed from an eminent spiritual lineage, it was dangerous for him to partake in public life, and Rinpoche took this turn of events to dedicate himself for the next 19 years to solitary retreat. During that time, His Eminence contemplated and realized all the teachings he had absorbed and meticulously memorized. He completed the great deities’ meditation stages as well as all points in the sūtras and tantras. For some time, Rinpoche subsisted on a diet consisting of flowers, relying on the practice of metok chulen (partaking of the essence of flowers), which brought great clarity and depth to his meditation. It also permitted Rinpoche to continue his meditation practice in the absence of provisions, and in the face of Chinese intervention. “Rinpoche lived in his cousin’s house in Lhasa from 1965 to 1985, without coming out. He acted like an invalid. His room had no window, only a small space for ventilation above the door. Rinpoche stayed in one room for eight years, then he went to another room for the remaining eleven years. I saw the second room and it was dark, really dark. When you walk in you can’t see anything, but slowly as your eyes adjust you can make some things out. Even now at Sera when I come to open the shades in Rinpoche’s room he says no, no. I think only for my benefit he lets me open the shades. He didn’t take even one step out of those rooms for nineteen years. To do retreat, normally, you need texts, a tangka, drum, bell, vajra, all these things, but Rinpoche only had a rosary. There was no altar, no text, nothing. He had already finished all the memorization of all the texts and prayers during his years of study at Sera, so he didn’t need these things. The Chinese were always checking what he was doing; they would come to the house several times a day, and if they found any religious object they would have taken him away. 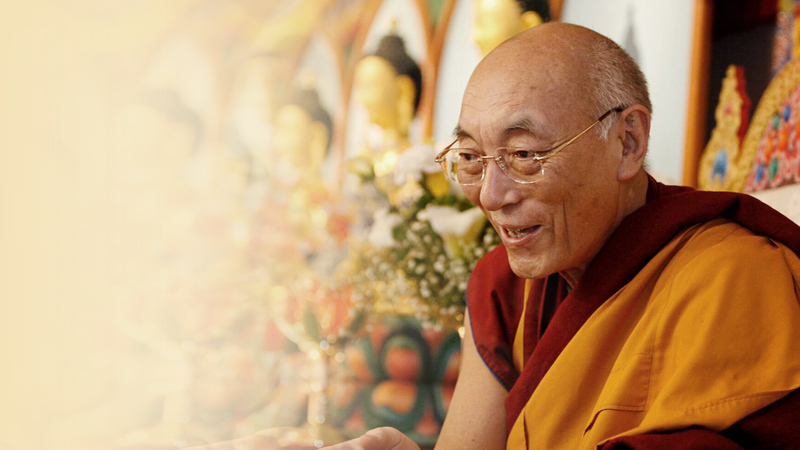 So Rinpoche did all the retreats using just his mind; everything was in his mind. But he would never say this himself; he just says he was sleeping, thinking a little about the Dharma. Asking His Holiness for directions of whether to return to Tibet or stay in India, Rinpoche followed His Holiness the Dalai Lama’s advice and started teaching in Nepal. After a short period, His Eminence was invited to South India’s Sera monastery, where highly realized lamas were intensely sought after for the training of the young generation of scholar-practitioners. There, Rinpoche ordained several hundred monks over the years, and was renowned for his theoretical expertise and pure conduct. In 1998, Rinpoche first came to the West, following the invitation of Ven. Massimo Stordi and Geshe Soepa of Arya Tara Institute in Germany. Lama Zopa Rinpoche also invited Rinpoche to come and teach at Vajrapani Institute in California, and so Rinpoche’s teaching activities began to spread to western shores.